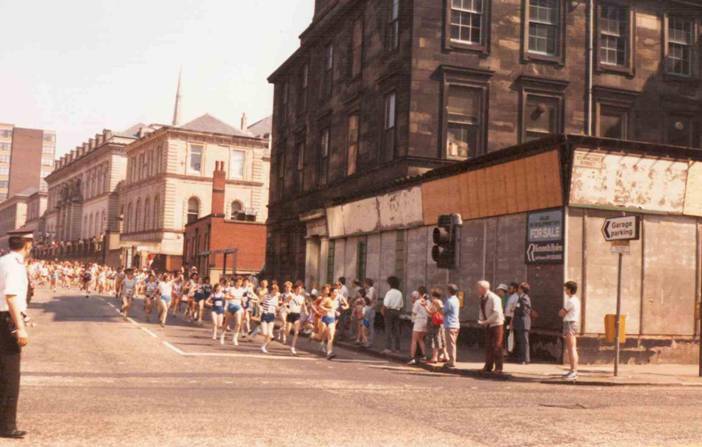 Like the ‘Coatbridge 5′, Glasgow’s ’10K – OK’ was only held for a few years – from 1984 through to 1990 – but as a women only race through the centre of a major city with a large field ranging in ability from the very best in the country to those with less lofty ambitions, it was significant in the history and development of women’s road running in Scotland. It started as part of the fund raising for the Prince & Princess of Wales Hospice in Glasgow and with a great deal of publicity. The centre of Glasgow was pretty well closed down for the duration of the race (easily seen in the two pictures of the start) great crowds turned out to spectate. In the first race Miss Glasgow started but it’s not clear whether or not she finished – she can be seen in the picture above wearing her sash – with Mya Baker (who finished third) just behind Miss Glasgow. With a fair bit of sponsorship right from the start it built up over the years to become one of the best sponsored in the country. It had a winning combination of good organisation and good cause that proved a success in anybody’s terms. It was also an idea whose time had come: Mass participation events had been mainly marathons up till then and the new half marathon distance was now quite familiar. 10K at this point was new, easily manageable by anyone so long as they had enough time and were either persuaded or swept into it. There was a clear end point too – helping fund the Hospice. Not only was it a good cause that was attractive but the organisation was of the best: after the first race, the SWAAA and SWCCU became involved and their experience was more than useful but the master organiser of big races, Strathclyde University staff member Alex Johnston from Lenzie was in charge. He had organised many such races and wrote detailed articles on how to go about it, including getting the finish arrangements right. With hundreds of runners approaching the finish, all expecting times, brooches, Mars bars, water and whatever else was being given out without delay it was imperative that a good team of stewards was in position when the first runner arrived. Alex and his team ensured that this was the case. The race programme and pre-race instructions to athletes were really detailed with the needs of the participants the main concern. There was a page of do’s and don’ts. “The first hint of summer sunshine brings with it the final busy preparations for the annual 10K – OK Race and the hope that this year’s race will, as always, bring together women of all ages and from all walks of life. Those who have trained for months and those who have made a last minute effort will join in the fun and fund raising – thus participating in a positively healthy event and at the same time help a most worthy cause. Since last year’s race, the work of the Prince & Princess of Wales Hospice has continued with almost three hundred patients cared for. The Day Hospice is fairly established as a centre of excellence for the terminally ill and has become fondly known as “the club” to many patients and their families. Attendances at the pain-relief clinic each Wednesday morning have numbered two hundred and seventy eight – with patients benefiting from a combination of modern medicine and a relaxed and pleasant environment. Our home-care team, extended now to three nurses and two GP’s, have made nearly three thousand home visits. Caring for patients and their families at home is a fundamental part of the Hospice philosophy and it is always gratifying to see a family manage, with help, what might be otherwise an unmanageable situation. Expert nursing, willing volunteers, a friendly face, a night sitter – all combine to keep patients comfortable at home. Recently builders arrived on site at Carlton Place and work began on an extension to the Hospice which will provide much-needed in-patient accommodation. We have had a wonderful boost of a visit to our Garden Festival Tapestry Event by their Royal Highnesses The Prince and Princess of Wales – when the royal couple again showed their interested support of Glasgow’s Hospice. We look forward to receiving our first residential patients early in 1989 and meanwhile I take this opportunity to than all participants in the 1988 10O – OK for giving us their support for this year’s event and wish good luck to all who run for other charities. The event was always billed as a ‘race’, the awards were attractive and the quality of the runners at the head of the field was undeniably high and was rendered even better by the inclusion, first of all, of the SWRRA Championships, and then higher still by the introduction of an international event. But there always great care taken to encourage as many women as possible, whatever their level of fitness, to get moving, to take part, to raise their fitness level and raise money for a good cause. Other races have done so too but the 10K – OK was one of the very first and, I firmly believe, did so better than almost any other before or since. The route was basically a single loop of the city centre starting and finishing at Charing Cross. Let’s look at it and then at the actual races. 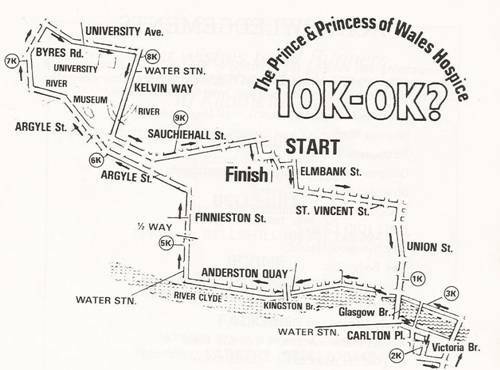 The first 10K-OK was held on 26th August, 1984 and, as reported above, was run by Strathclyde Regional Council and the Prince and Princess of Wales Hospice. The route started in Elmbank Street and went south to St Vincent Street, east to Renfield Street then to Glasgow Bridge via Union Street and Jamaica Street. Over the bridge the course went along Carlton Place to South Portland Street, west on Oxford Street and on to Victoria Bridge via Norfolk Street and Gorbals Street. Back on the North of the river, the course went west along the River Walkway, under the Suspension Bridge and Glasgow Bridge then west along the Broomielaw, Anderston Quay, Lancefield Quay. north on Finnieston Street and then west along Argyle Street and Dumbarton Road. North on Church Street, Byres Road, east along University Avenue, south on Kelvin Way and east along Sauchiehall Street. The run home then went south on North Street (! ), east along Bath Street, south on Newton Street, east along Elmbank Crescent and south into India Street for the finish. No part of the city was untouched by the route which the organisers divided into the Hospice Loop. Clydeside and the University Loop. This first year had 572 finishers and of these 294 finished in under one hour. The first 100 were given an engraved pendant on a chain and this continued for the next three years. 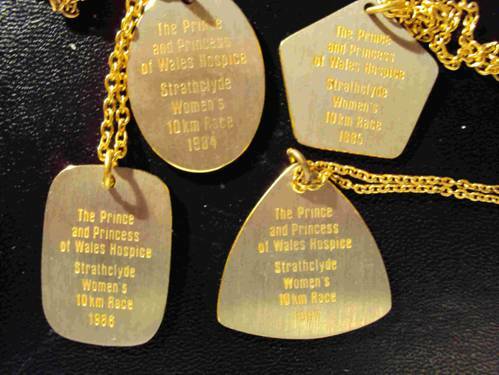 Sandra Branney who went on to become a Scottish Internationalist runner on road, track and over the country says that it was her first ever race and because of that it still means a lot to her – she still has all the pendant from her races. There are interesting names all the way through the field indicating the range of interest generated. For the record the first twenty in the first race were as follows. Liz Steele was already an established runner, well-respected for her ability, Jane Walker on the other hand was almost a total newcomer, a PE teacher from Strathkelvin she too would become an international runner. Janet McColl too had been running since she was a girl and her name appears throughout cross-country championship lists in almost every age group. Morag Thow was also well known and went on to become one of the country’s best physiotherapists. Sandra we have spoken of already and Elspeth Turner from Bearsden would go on to win championships and medals as well as international vests as a Senior woman and in University competition with Strathclyde University. Aileen Lusk was a veteran international runner who by now was running and coaching at Strathkelvin Harriers in Bishopbriggs. Not far below them was the name of Nanette Mutrie who was a lecturer and academic in sports psychology. The improved quality of the race was indicated by the times of the athletes and placings compared with the first in the series. Janet McColl, for instance improved her time by two minutes to 38:33 but actually dropped five places to ninth, Jane Walker improved the time marginally but fell back from second to fifth and there are many similar examples. However there were a number of runners who achieved vast improvements on their first outing – we only need to look at Sandra Brannery (17th in 44:33 to 4th in 37:30 and Elspeth Turner (18th in 44:34 to 3rd in 36:03) to see extreme examples of that. The runners also came from much further afield – the first two were from Dundee and Aberdeen respectively but there were runners from all over the country: from Nith Valley and St Andrews as well as from Victoria Park and Shettleston. It was the biggest women only race in Britain. The first twenty this year are in the table below. Not unnaturally the race was starting to attract attention from the press and in an article in the ‘Glasgow Herald’ Alan Campbell’s headline was ‘Girl studying in the US wins road race’. The second paragraph read “There were more than 1500 entrants for the race, of whom 1200 materialised on the starting line in the city centre yesterday morning. The figure more than doubled last year’s inaugural race proving that running has taken off as a sport among Scottish women.” It certainly had. 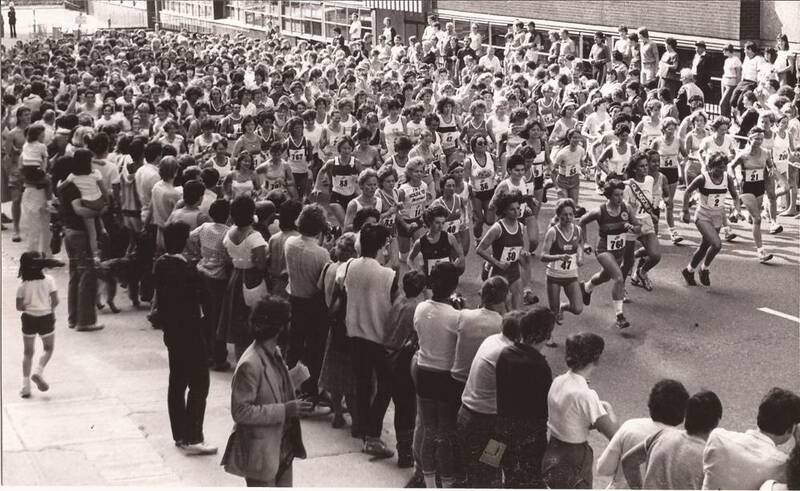 The race in 1986 had 1700 runners and not only was that total the highest yet, but the quality at the front end was also superb: Liz Lynch won for the second time in 33:03, Lorna Irving was second in 34:37 and Sandra Branney progressed to third with a time of 34:59. Then in fourth there was Audrey Sym in 36:02, Sharon Sinclair (36:09) and Gail Macdonald in 36:50. In 1986 it also became the official Scottish Women’s Championship and continued as such for the next few years. The following year the race was run on Sunday, 7th June in 1987, the race was won by Sandra Branney at the fourth time of asking in 33:48 – eleven minutes faster than her first ever race in 1984! An International was now incorporated into the race and she was followed home by Sally Lynch (Wales) in 34:19, Christine Price (Scotland) in 34:25, Bronwen Cardy (Wales) 34:28, Moira O’ Neill (Northern Ireland) in 35:33 and Sharon Sinclair (Scotland) in 35:36. This time Sandra was not racing for City of Glashow but for her country and she led the team to victory. Seventeenth to first, Scottish 10K Road Champion and winner of the international race in just four races. Not bad at all and no wonder Sandra looks back on the race fondly! In 1988 Glasgow hosted the third of the five British Garden Festivals, and the only one to be held in Scotland. It ran from 26th April to 26th September and was blessed with good weather for virtually the entire duration. It was held on the south side of the river and the race route was entirely on the north side but the organisers did look at a plan for actually starting the race in the Festival and crossing Bell’s Bridge to join the traditional loop and finish as usual at Charing Cross. It didn’t come to pass but it was a nice idea. Alison Jenkins (Edinburgh AC) won the race in 1988 in a slower time than usual of 34:40. She was followed by S Leonard (England) in 34:48; S Sinclair (Irvine/Scotland) in 35:17; S Bentley (England) 35:21; A Sym (Glasgow/Scotland) in 35:39; C Haskins (England) 35:36; T Duffy (Ireland) 35:50 and M Smith (Wales was eighth in 36:23. Scotland won the team race, and Glasgow AC won the club event. If Sandra Branney liked 1987, she must have loved 1989 when she not only won the race, but was first veteran, also won the Scottish 10K Road Championships and was first in the International! One race, four firsts! The race result: 1. S Branney (Glasgow/Scotland) 34:03; 2. M O’Neill (N Ireland) 34:24; 3. K Pritchard (Wales) 34:33; 4. S Lynch (Wales) 35:07; 5. L Bain (Scotland) 35:27; 6. B Cardy-Wise (Wales) 35:47; 7. N Haines (Wales) 36:24; 8. J Swanson 37:12. Teams: 1, Wales; 2. Scotland; 3. N Ireland. It is difficult to over-estimate the effect that the race had on the sport, the women of Scotland, and more particularly Glasgow, and subsequent events whether women only or not. The current Glasgow Women’s 10K is a very good race but it started from a position where the 10K was a more recognised and better known distance, and when many women had already had run the distance several times before. In addition the invitations to the top women in the world alters the race as it was run in the 1980’s. The race then started from scratch and a lot of pioneering work was done making the race an instant success with many really good athletes at the front, a solid mass of club runners behind them – and then even more women behind them who were basically first- or second-time runners. Given the different starting points it is arguable that the 10K – OK was a bigger success than its successor.